For some, Mother’s Day evokes happy childhood memories: waking up early with Dad to whip up a stack of blueberry pancakes that you’d bring up to Mom in bed. For others, it’s another Hallmark Holiday designed to get you to spend money on faux-calligraphed greeting cards that may enjoy a short life on the refrigerator before ending up in the trash. Wherever you fall on the spectrum, give Mom what she really wants this Mother’s Day: family facetime, perfectly poached eggs, and strong cocktails. 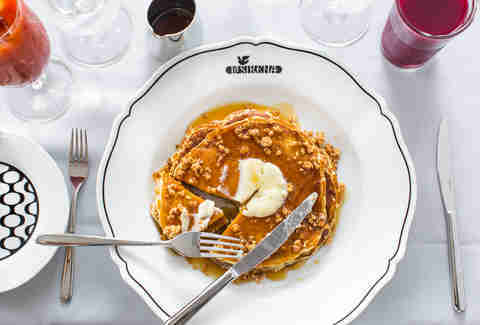 This Sunday, cozy up with her at one of these brunch spots -- breakfast in bed not required. 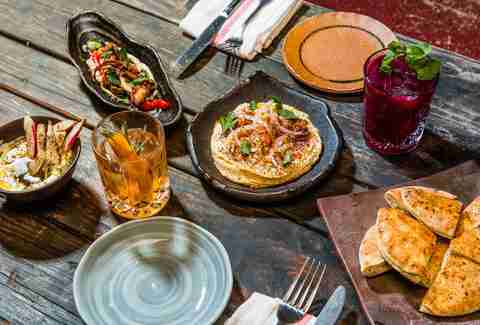 In addition to Shuka’s famed brightly colored dips and mezze, the lively Israeli-, Spanish-, and North African-inspired spot will offer a couple of Mother’s Day brunch specials. Split the shakshuka with Mom -- poached eggs swimming in a spicy tomato sauce studded with asparagus -- along with an order of the Tunisian tuna salad, flush with cucumber and potatoes. Finish off the meal with a slice of poppy seed coffee cake, swiped with cardamom lemon glaze. Woman-owned and operated, De Maria is all about celebrating ladies. During Mother’s Day brunch, mother/daughter duos will receive a bottle of red wine, on the house. 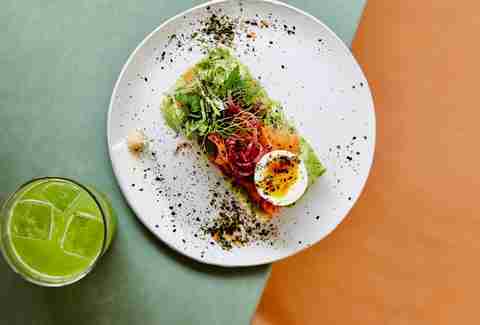 Once you’ve uncorked, order up Instagram-friendly dishes to share: the Monkey Bowl, with turmeric white bean hummus, is crowned with coconut grains, poached eggs, and carrots; the decadent chocolate avocado cake boasts a lime avocado frosting. Lounge on the patio overlooking Ninth Avenue while you treat Mom to a three-course, $49 Italian brunch. Choose from small plates like the always popular burrata, or the avocado crostini piled with cherry tomatoes and ceci beans. 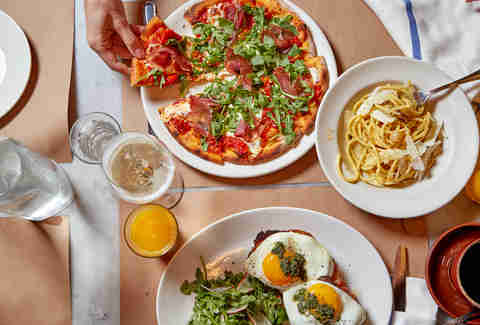 Then lean toward the big kickers like French toast with dulce de leche, pineapple, and cinnamon ricotta, or more savory dishes like rigatoni alla norma, and steak and eggs. Zag from the ubiquitous pancake and waffle deals at the teeny Little Tong Noodle Shop. 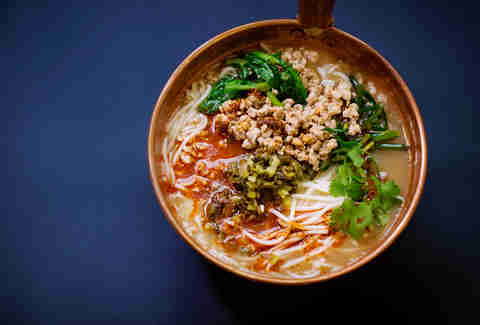 Along with the regular menu of Yunnan-inspired rice noodle bowls and small plates, the kitchen will offer a one-day-only Mother’s Day special: tomato and scrambled eggs with braised sweetbreads -- a traditional Chinese dish often prepared by mothers. 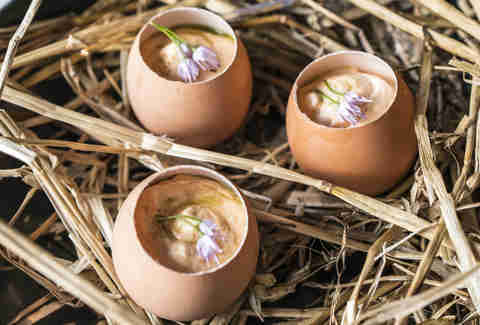 A three-course, $50 brunch special will showcase this restaurant/grocery’s seriously good grub. Choose from the antipasti (think creamy, house-made ricotta cheese flanked by spring greens and crunchy quinoa), secondi (bucatini carbonara swirled with egg yolk, guanciale, and pecorino), and dolce (rhubarb crostata plopped with a dollop of buttermilk sherbet). Spring for the $12 pastry basket, filled with house-made sweets like olive oil cake and bombolini. 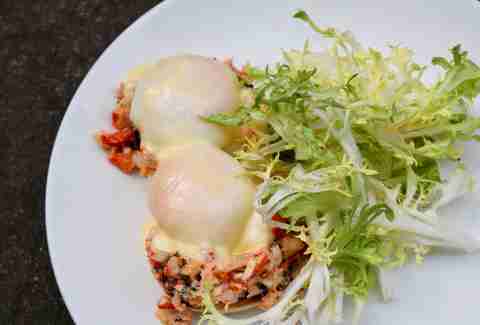 Need a brunch feast fit for a queen? Count on Kingsley’s four-course, market-forward special. The menu is studded with elevated classics, like buttermilk biscuits paired with house-cured maple bacon, spring onion hash with scrambled eggs and black truffles, and a strawberry rhubarb shortcake to get you in the warm weather mood. “Don’t fill up on bread,” moms caution. Prove they’re as wrong about that as they were about your high school boyfriend with the abundant, warm, pillowy pita at this pocket-sized Middle Eastern gem. 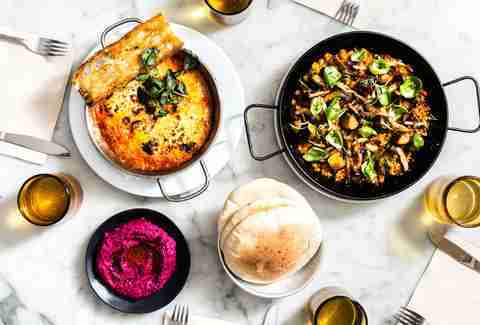 Scoop up dips like whipped ricotta drenched in brown butter and bright pink beet puree, sample sweets (ricotta waffle drizzled with chocolate tahini) and savory items (steak & eggs flanked by smashed potatoes), then order at least one sandwich, because you can never have too much pita. 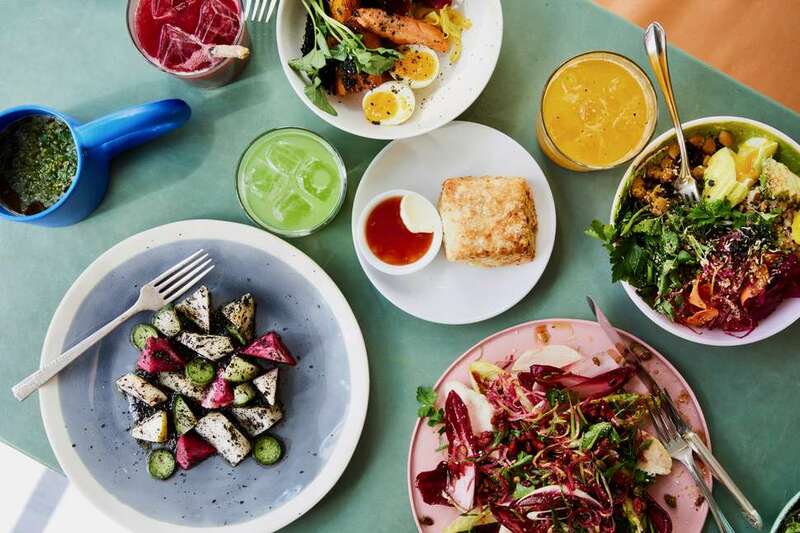 Known for its unorthodox Indian fare, Rahi has put together a distinguished Mother’s Day brunch menu -- plus, Mom can sip a complimentary Bombay Bellini with her meal. Sample the smoked salmon masala toast (featuring Russ & Daughters smoked salmon) and the house specialty Egg Roast: egg yolk, tomato mousse, and smoked chili in an eggshell. Locals and visitors crowd outside this cult-adored brunch spot each weekend, patiently waiting for deep-fried French toast balls and the beloved, ever-cutesy Donut Diva doughnuts. Brunch is a scene here, but that’s why people love it. On Mother’s Day, indulge your palate with a King Creole Benedict (with fried tilapia, shrimp, and cornbread), and fiery rounds of deep-fried mac & cheese-coated in Sriracha. 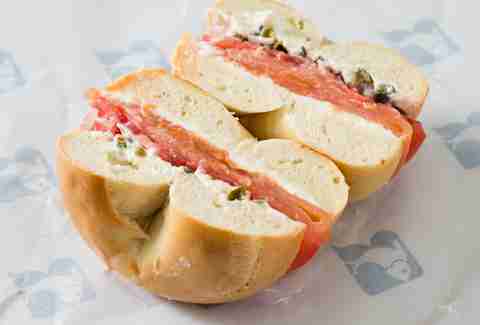 What better way to celebrate Mother’s Day than with best bagels and schmear in the business? Get comfy in a booth, and dig into a classic boards weighed down with nova, cream cheese, and bagel accoutrements (and a bagel, of course). There are sweets, too, like challah bread pudding and chocolate babka French toast, to offset all that smoked salmon you’ll be putting away. Amy Schulman will probably attempt waffles in bed. Follow her on Instagram.